Where has the time gone? It seems like only yesterday that we were ushering in 2014 and here we are, getting ready to ring it out and welcome in 2015! Let’s close out the year with a bang. Go big or go home, they say. So this month, we are going big! 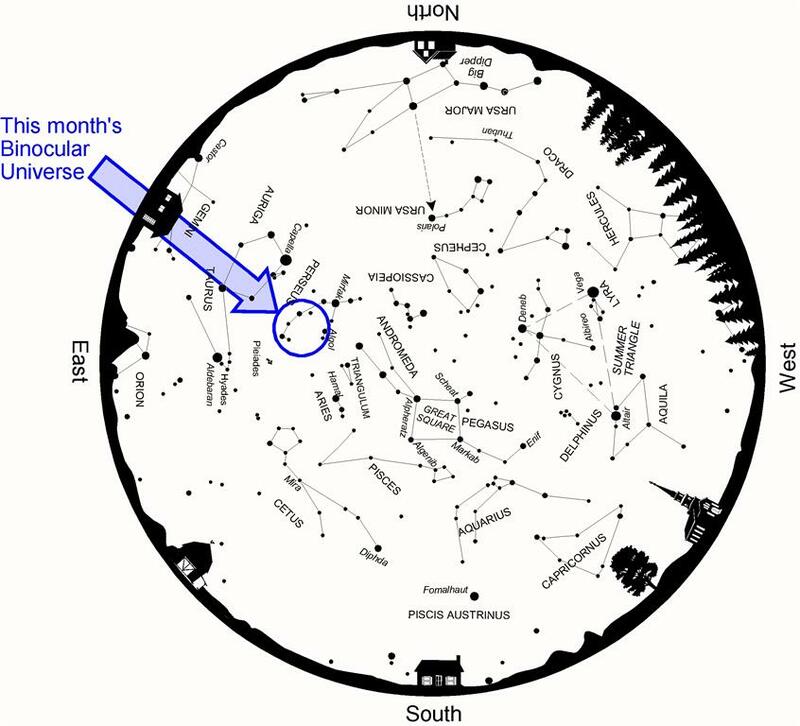 Above: Autumn star map from Star Watch by Phil Harrington. 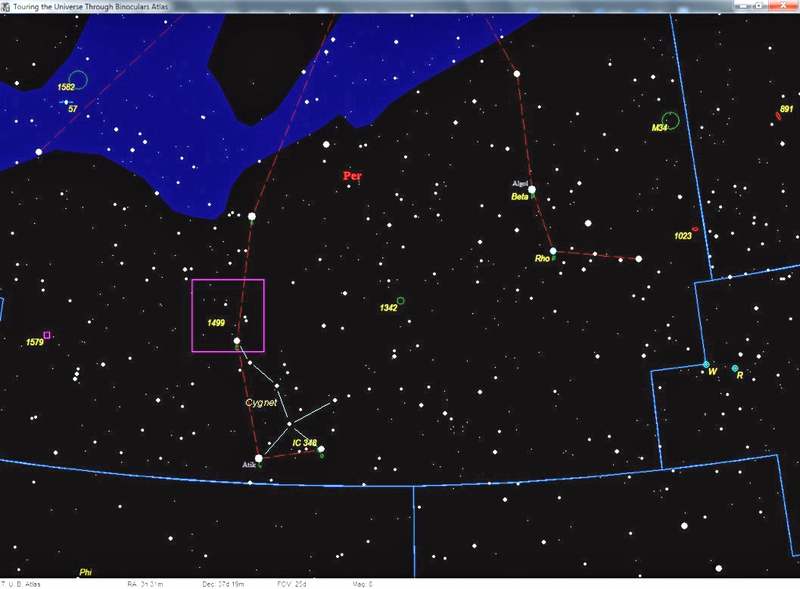 Above: Finder chart for this month's Binocular Universe. First up, we have NGC 1499. Nicknamed the California Nebula for its likeness in long-exposure photographs to the Golden State's outline, NGC 1499 is one of those targets that puts even the most experienced observers to the test. It’s not that it is hard to find. NGC 1499 lies just northeast of Xi Persei . No, the problem is one of size. Too much of a good thing, I’m afraid. From tip to tip, NGC 1499 measures 2-1/2 degrees long and 3/4 degree wide. Add to that the fact that, like so many clouds of glowing hydrogen, NGC 1499's surface brightness is incredibly low because of its primary emissions are restricted to the red portion of the visible spectrum. Our eyes are very poor red receptors in dim lighting. Even with a pair of contrast-enhancing filters in place -- Hydrogen-Beta are the best -- it’s a tough catch. So, let's talk strategy. The California Nebula is easy to pinpoint thanks to 4th-magnitude Xi Persei, just 1° to its south. But that star, which is the ionizing energy source for the nebula's glowing hydrogen clouds, is both a blessing and a curse. While it makes zeroing in on the nebula a snap, its light can easily overwhelm the nebula's weak glow. That is why knowing how to look for low-surface-brightness objects is just as important as knowing where to look. By mounting your binoculars on a tripod or other support, the star can be moved out of view, extinguishing its interfering presence and improving the odds. Using averted vision, start with the slightly brighter northeastern edge of the cloud, opposite Xi, and then trace out the nebula's "Pacific coast." Its glow is very dim, but the long, slender profile is unmistakable once you realize the shape and size. Several superimposed stars remind me of lights from distant cities. The brightest, a 6th-magnitude sun, lies just offshore about where San Francisco would be, and marks a crook in the coastline. As I was straining to see the California Nebula last month, I noticed a surprisingly obvious little asterism that I’d like to call attention to. It’s drawn on the chart here and looked to me like a baby version of Cygnus the Swan. Christened Cygnet, our baby swan has Xi Persei as the tip of its beak, while Omicron Persei serves as its head. Zeta and 40 Persei mark the ends of its outstretched wings. Cygnet looks like it’s furiously trying to keep up with Cygnus as the latter heads toward the horizon these evenings. Notice how IC 348 lies just south-southeast of Omicron Persei at Cygnet’s head. Photographs reveal this a weak but tightly packed open cluster of 21 stars engulfed in the subtle glow of surrounding nebulosity. The question of whether or not Omicron physically belongs to the cluster has been, and continues to be, debated. General consensus now is that the star is not a member. If not, then the brightest stars in the cluster shine at 10th magnitude. Can you pick out the cluster? It's tough in my 10x50s, but more apparent in my 16x70s. Halfway between Zeta and Beta Persei (Algol) and smack dab in the middle of the chart, we find open cluster NGC 1342. At 7th magnitude, this dense open cluster spans 14 arc-minutes. Through most binoculars, it looks like a tiny tuft of soft light that some describe as "triangular." NGC 1342 is listed on the Astronomical League’s Deep Sky Binocular Club roster, but it really needs giant binoculars to be appreciated. Careful scrutiny through my 16x70s begins to resolve a few of its stars, none of which shine brighter than 9th magnitude. I can make out a dim grouping of four stars in the northeastern corner of the cluster, as well as a pocket of three suns to the northwest. Finally, tucked inside the northeastern corner of the chart here, we have the open cluster NGC 1582. You and I bumped into this group back in the December 2010 Binocular Universe column. As noted back then, you’ll need dark skies to pick this one out from the surroundings. My 10x50s show a smudge of distant starlight just beyond a tiny Y-shaped asterism of stars. Use the double star 57 Persei to its south as a pointer. Even if you can’t see NGC 1582, 57 Persei is a nice enough catch to make the effort worthwhile. Here we find a pair of 6th- and 7th-magnitude white-hot F0 stars shining amongst a striking Milky Way field. Nearly 2 arc-minutes separate them, so they are easily resolved through small binoculars. As you can see from the list below, there are many other targets in this corner of the late autumn/early winter sky to explore tonight with your binoculars. Why not give each a try? Questions, comments, suggestions? Lets talk! Post them in this blogs discussion forum or please e-mail them to me using the link above. So, until next year, tell your friends that for stargazing, two eyes are better than one. Phil Harrington's Binocular Universe is copyright 2014 by Philip S. Harrington. All rights reserved. No reproduction, in whole or in part, beyond single copies for use by an individual, is permitted without written permission of the copyright holder. Thanks as always for your article. Now if only the "lake effect" skies in my area would cooperate! How much aperture would be required for 891 and the California nebula? Do you think 20x80's from a green area would be enough?